Earn 7.8 SB per $ when you buy Cabela's gift cards at MyGiftCardsPlus, powered by Swagbucks. Cabela's has been outfitting outdoor enthusiasts for more than 40 years. During that time, their goal has remained the same: provide their customers with the best outdoor gear available. They carry the best in fishing, hunting and camping gear, along with clothing, footwear, and much more. Everything they sell is backed by their 100% Satisfaction Guarantee. Call for their free catalog or visit their website at www.cabelas.com , and see all the reasons why Cabela's remains the World's Foremost Outfitter. 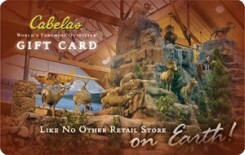 A prepaid card redeemable for merchandise at all Cabela's locations, for Cabela's catalog purchases, and at www.cabelas.com (there is no limit to the amount of cards that can be used online). CANNOT be used for payment on Cabela's Charge. For gift card balance call 1-800-237-4444. Cards do not expire.